Before I even get into these cookies, thank you...from the bottom of my heart... for your support with my last post about my struggles after my daughter was born. The outpouring of love on facebook was amazing. So again, thank you. I love you guys. Let's move on to the cookies, mmmmkay? I made these for a Superbowl party we were going to. Landon loves helping me in the kitchen so I knew I wanted to make some type of cookies but I wasn't feeling too inspired. I took my trusty cake batter cookie recipe, made two different types, smashed them together, and ta-da. 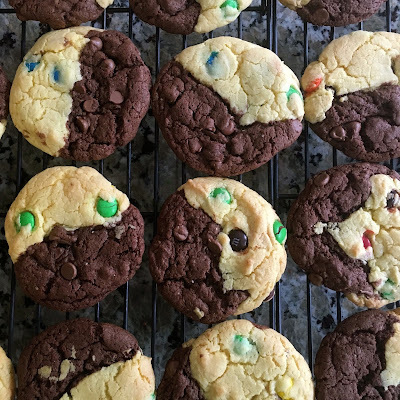 These were delicious, fun to look at, and easy to make. 2- Line cookie sheets with silpats or spray with non-stick spray. 3- In two separate bowls, combine the cake mix, baking powder, eggs, and oil. Stir well. 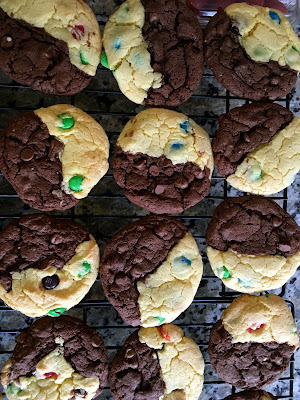 Fold in the M&Ms to the white bowl and the chocolate chips to the black bowl. 4- Using a Tbsp measuring spoon scoop one Tbsp of each mix and press together gently, side by side. Lay on cookie sheet. 5-Place no more than 8 cookies on a sheet at a time, these are large and spread. 6- Bake for 11-13 minutes, just until the edges are slightly brown. 7- Allow to cook 5 minutes on the baking sheet before transferring to a cooling rack. Glad to see you back in action!! !